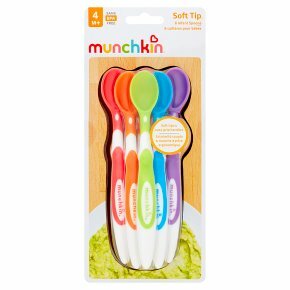 Pack of 6, soft tip baby's spoons feature curved, easy grip handles and are flexible and soft, so gentle on baby's gums. For your child's safety and health. Warning! Always use this product with adult supervision. Before each use, inspect the product. Throw away the first sign of damage or weakness. Always check food temperature before feeding. Before first use, clean the product. Do not boil or steam sterilise. Do not use abrasive cleaning agents. Do not expose to prolonged sunlight. Do not let child walk or run while carrying the product. Do not place in a microwave or hot oven. Top rack dishwasher safe. Not suitable for freezing. Please read and retain this information for future reference. Remove all packaging components before use. Colours and styles may vary slightly.